“It is a bold, audacious declaration, the sort of thing—would’t you know it?—Jesus would say: ‘Nothing will be impossible for you,’” said Edwin Hurley, senior pastor of South Highland Presbyterian Church, Birmingham, during Samford University’s Beeson Divinity School commencement and service of consecration May 8. But faith that is not connected to Jesus Christ is not faith, he continued. How can we stay connected to Jesus Christ? Hurley offered four ways: look to him, listen to him, love like him and lead like him. Since the founding of Beeson Divinity School, every faculty member has offered a prayer or blessing of consecration for each graduating student during the service of consecration. Beeson Divinity School does not have “the ecclesial authority to ordain anyone, but in this holy moment, we do commit these students to the service of the church and the work of God throughout the world,” George said. 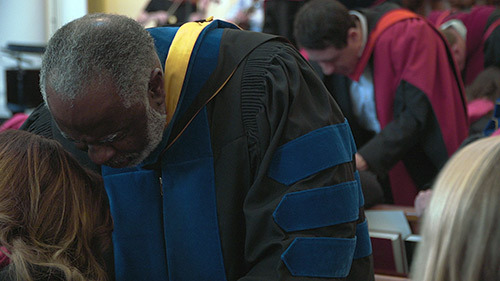 Two students received a Master of Arts in Theological Studies degree;18 students received a Master of Divinity degree, and two students received a Doctor of Ministry degree.